The United Mine Workers Union (UMWA) was founded in Ohio in 1890. British immigrants played an important role in the early days of the organization. John Rae, he first president, was originally from Scotland and the first secretary, Robert Watchorn, came from Derbyshire in England. Under the leadership of John Mitchell (1898-1907) the union grew rapidly and he organised successful strikes in the bituminous and anthracite coal fields in 1897 and 1902. William B. Wilson and Mary 'Mother' Jones were other important figures in the UMWA during this period. Mitchell was followed by T. L. Lewis (1908-1910), John P. White (1911-17) and Frank Hayes (1917-19). In 1919 John L. Lewis became acting UMWA president when ill-health prevented Hayes from carrying out his duties. Lewis was elected president in 1920 and remained in the post for the next 40 years. With growing unemployment in the 1930s, membership of the UMWA fell from 500,000 to less than 100,000. In the 1940s Lewis led a series of strikes that resulted in increased wages for miners. This resulted a growth in union members to 500,000. Congress responded to the success of unions such as the UMWA by passing the Taft-Hartley Act (1947) that placed new restrictions on trade unions. When John L. Lewis retired in 1960 the union went through a difficult period. Thomas Kennedy, the next president (1960-63) was followed by Tony Boyle (1963-72) However, he was convicted of the murder of the union activist, Joseph Yablonski and his wife and daughter. Arnold Miller (1972-79) replaced Boyle and he was followed by Sam Church (1979-82), Richard Trumka (1982-1995). In 1964 the union had 450,000 members but by the 1990s this had fallen to 200,000. (3) In his unpublished autobiography William B. Wilson wrote about his campaign for a closed shop in the mining industry. Union men generally believe that there is no such thing as an open shop except on a small and insignificant scale. An operation either becomes all union or all non-union and is ... promulgated principally by antagonistic employers who do not hesitate to discharge a union man whenever they find him in their establishment.... 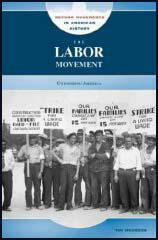 It is generally acknowledged that the aggressive power of a union in periods of industrial activity and its defensive strength during periods of depression maintain a higher standard of living not only for themselves but for non-union men in the same line of work than would be obtained with out it. Reasoning from that standpoint, they insist that common honesty should teach the person who receives the benefits brought about by the union to pay his share to maintain it.